If candidates like Marli Banks are elected to the town council its meetings will be much briefer and a lot more focussed. In her interview with the Alice Springs News Online at 8am today the business woman and mother of two young children had no trouble summarising in five minutes and two seconds her views on the five initiatives she most liked of the council coming to the end of its term, as well as the five which she wants to see the new council to tackle. This was after emailing her CV at 11:12pm yesterday and before rushing off to the pre-polling booth to hand out how to vote cards. 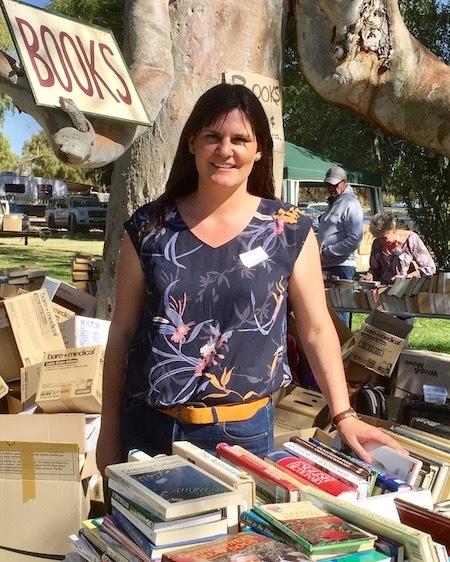 • Supporting the Alice Springs library which offers a “collaborative and non-discriminatory working space, an example of how council services can be accessible to all people”. • Moving financial discussion from confidential to the open part of the council meetings, accessible to the public, which improved accountability and transparency. She recognises the role of Cr Eli Melky in that change. • Improvements to waste management, especially the re-introduction of recycling. • Getting Federal money for the Ilparpa Road improvements under the Black Spot program. • The inter-denominational chapel at the cemetery, giving grieving people access to a “dignified memorial”. • Re-establishing strong working relationships with the community through active consultations, enabling “all residents” to keep themselves informed about new projects and developments. Create amenities and services that support socially inclusive spaces. • Sustainable design of the built environment, prioritising the aesthetics of the town, our natural assets. This should include managing the eco-system of the Todd River, re-designing safe, lit paths and corridors, connecting locals and visitors to what’s available in Alice Springs. • Improve waste management to include kerbside recycling and green waste. Remove and separate organic materials from the landfill. Manage waste to create a return for the community, producing high-quality topsoil and mulch while scaling down the size we need for our tip. Greenhouse gases should also be reduced, and potentially the council may qualify for carbon credits by cutting down methane emissions. • Raising the funding of public arts projects. We need to develop a sculptural walk “alongside our natural beauty”. Up to 10% of the graffiti removal budget should go to community mural projects. Evidence elsewhere in the nation shows that crime can be reduced by projects of that kind. “Let’s turn a problem into a solution, connecting the people through art,” says Ms Banks. • Re-establish Alice Springs as a solar city by setting ambitious goals to reach targets for renewable energy use. We need to improve infrastructure to be competitive in this rapidly growing industry. The motto could be “Alice Springs, Sun City, Solar Futures,” says Ms Banks. Her business and employment background required complex skills and sharp reflexes. She came to town at age 19 in 2001. Her early jobs included being a croupier in the casino and co-ordinating over 50 staff at Centrebet, the Alice Springs-founded company which pioneered online sports betting. In 2006 and 2007 she was the executive assistant at the Aboriginal NGO APY Services, and she has been the managing director for the past eight years of Afghan Traders. She describes it as a “thriving health food store producing healthy returns on investment”. Ms Banks serves on community committees including the Regional Economic Development Committee, the Steiner School management and the Central Australian Frack Free Alliance. PHOTO: Ms Banks volunteering at the Old Timers fete on Saturday. Is Eli Melky on board?